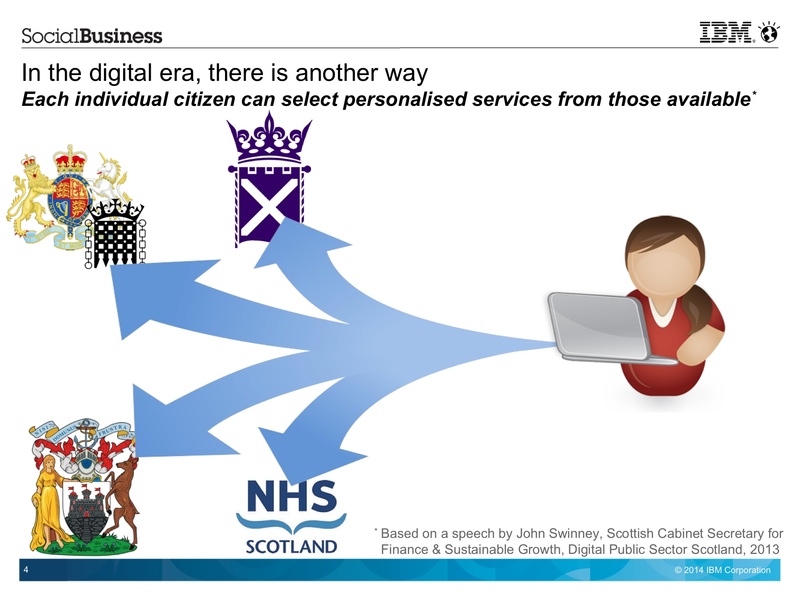 Traditionally I use the journey back from IBM Connect to put together a blog post based on buzz at the event to forecast key trends for the year(s) ahead (take a look at my 2012 and 2013 predictions and see if you think they worked out – most of them continue to be major areas of focus). Social Mail: The most exciting new announcement at Connect 2013 was IBM Mail Next. 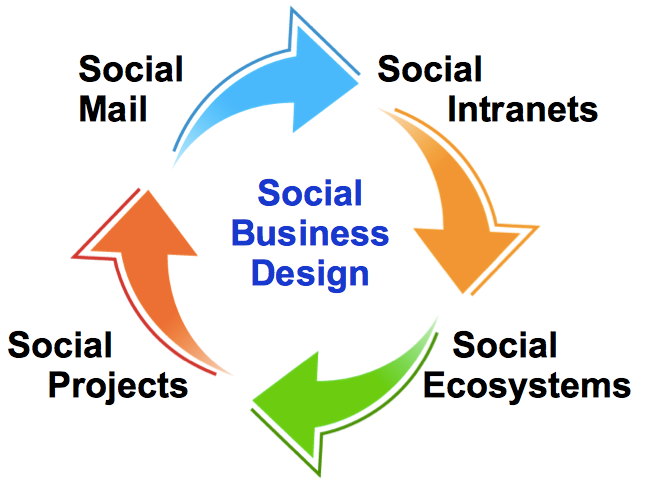 Until now, the infusion of social collaboration into the mail client has built out from the mail box. It has taken the form of sidebars, business cards, links and embedded experiences that seamlessly take the user from their mail to adjacent social content. IBM Mail Next reimagines the inbox in terms of the conversations you have having with other people and the actions and projects they are part of. By thinking about the context of the conversations, rather than the mechanism of the email messages, and by applying analytics and task management capabilities to help you keep track of your different activities, IBM Mail Next offers a user-centric tool for managing collaboration. Social Intranet: IBM Mail Next is browser or mobile app based, and is part of a broader trend to move all forms of collaboration, from collaborative document editing to real-time multimedia meetings, into pure browser applications that are also surfaced as mobile apps. 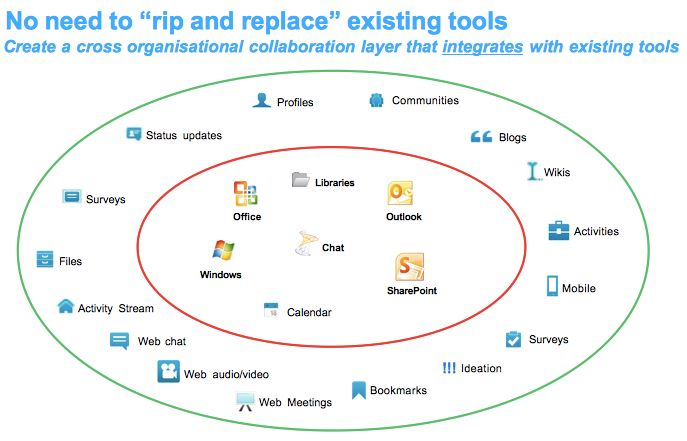 It has become clear that users prefer to do their collaborating from mobile devices, so this aiding the transition to a post PC era whilst significantly reducing desktop support costs (one of the biggest parts of the IT Budget). Indeed, bring your own device is rapidly showing that users would like to choose their own tools, and where organisations embrace this they can improve the user experience at the same time as reducing costs. 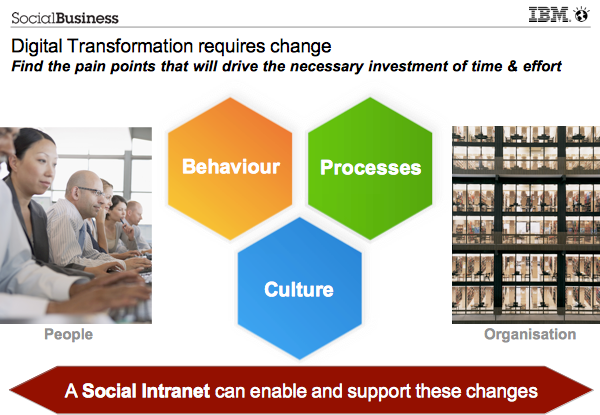 All of which makes the Social Intranet increasingly the core of enterprise IT: a single integration layer that provides role based, personalised access to applications, content and processes to each individual user via a browser or their mobile device. 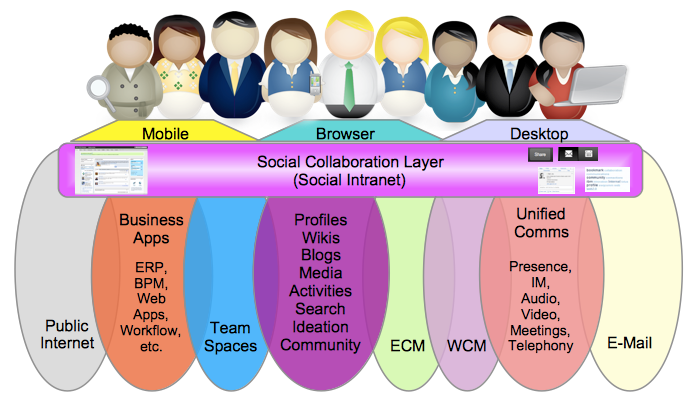 Social Ecosystems: But in today’s world, an intranet isn’t enough. 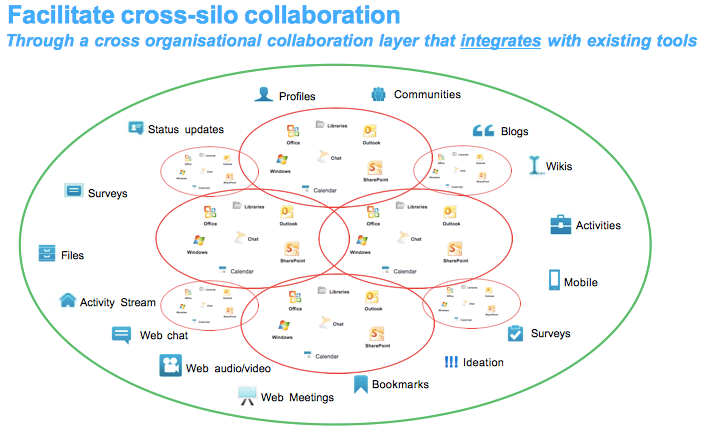 Modern enterprises can’t deliver what they need to through internal collaboration alone. Companies need their ecosystem of suppliers, partners and channel to deliver their brand value, and close collaboration with those organisations is critical to success. So just as the mobile trend is challenging the traditional concept of the corporate firewall, since most of the devices that need access to it spend most of their time outside of the firewall, so the need to provide access to applications, content and processes by external parties is forcing organisations to question their approach to the enterprise perimeter – and in the process giving them the opportunity to position Software as a Service (SaaS) as a natural extension to their intranet environment as part of a hybrid cloud infrastructure. 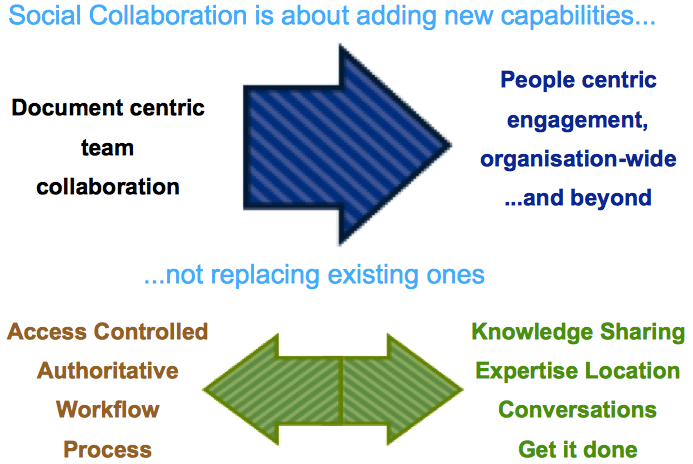 Social Projects: But this trend towards external collaboration with your ecosystem cannot be addressed by simply throwing open the gates to your network. What organisations need to do is define specific projects to deliver identified business value and then design a solution to address them. 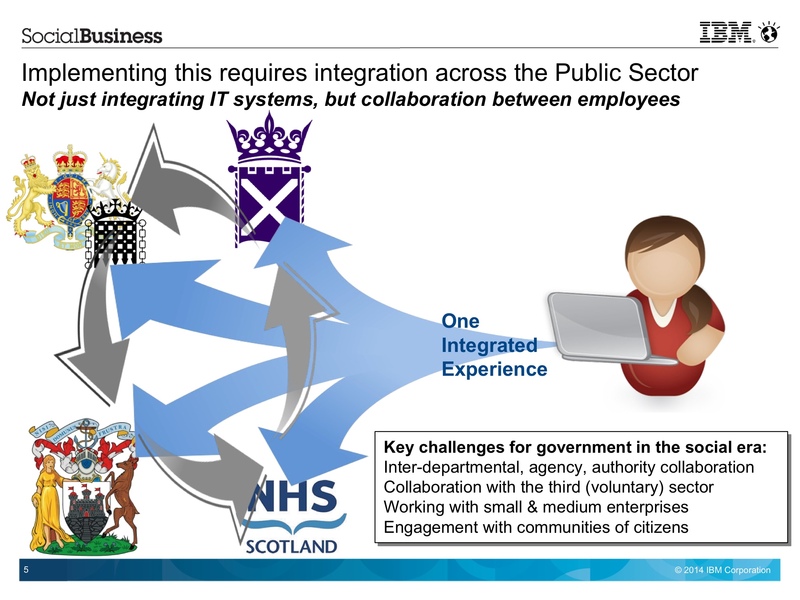 This is very different from the way IT traditionally create enterprise-wide infrastructures – but again, Hybrid SaaS comes to the rescue, avoiding the need to spin up new server infrastructures but instead reusing integration that has been done with SaaS services to create a model that accelerates return on investment by deferring costs until business value is realised. 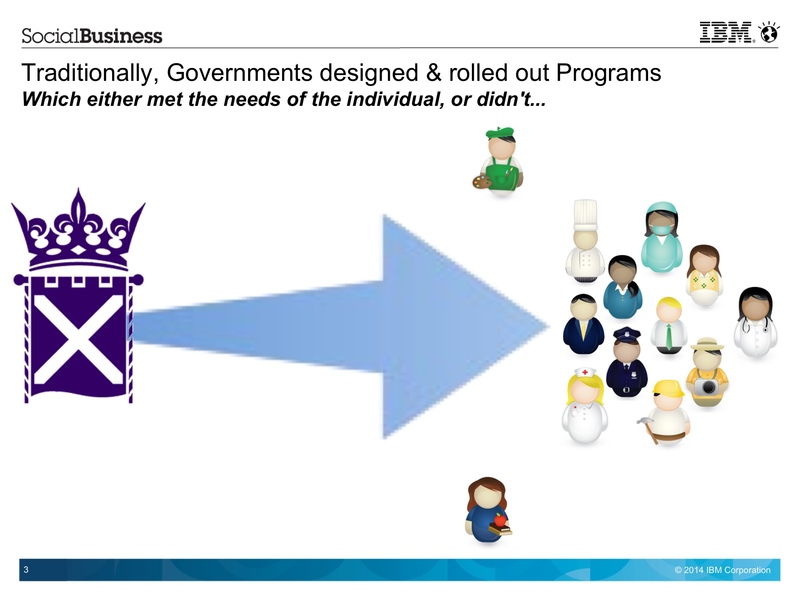 We are also seeing a revolution in the way we design these projects – no longer thinking about the data and applications you have available and how can they be delivered to the users, but thinking about the user journey required by the multiple actors within and outside the organisation to execute a required process to deliver maximum business value. Implementation is then about putting together those user journey (by integrating content, applications and processes from the intranet, leveraging the service oriented architectures of the last decade and cloud services of this decade) and delivering them through compelling browser and mobile app experiences using open, standards based integration. Users will access many of the processes delivered via these social projects from their new social mail environments, the social intranet will integrate them with the resources needed and the participants will not just be internal but spread across the whole social ecosystem – as a result driving new levels of personal and organisational productivity by making business processes easier, faster, cheaper and more satisfying to use.